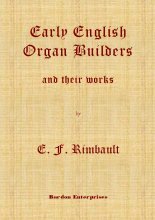 Description: This book is about the Old English Organ Builders, from the fifteenth century until the Great Rebellion (English Civil War). It is based on the text of a lecture given at the [Royal] College of Organists on November 15th, 1864. Rimbault, Dr Edward Francis. F.S.A. (1842), Ph.D. (Göttingen), Ph.D. (Stockholm, 1842), Hon.LL.D. (Harvard, 1848). Pupil of his father; of Samuel Wesley and Dr Crotch. Organist of the Swiss Church, Soho, London, 1832; St. Peter’s, Vere Street, London. A founder of the Musical Antiquarian Society, 1840. Composed an operetta, songs, &c. Wrote about musical history, &c. Son of Stephen Francis Rimbault. b. Soho, London, England, June 13th, 1816; d. Regents Park, London, Sept. 26th, 1876.